ABC Radio in Australia has done a lengthy interview with the man often referred to as “the sixth Beatle” – studio engineer extraordinaire Geoff Emerick. As a 21 year-old he was George Martin’s right-hand man in the control room on albums such as “Revolver”, “Sgt Pepper”, “The Beatles (White Album)” and “Abbey Road”. 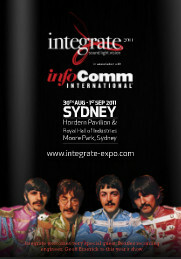 Geoff Emerick will be in Australia this week to attend “Integrate 2011“, a sound, music and light industry convention where he’ll give a special presentation that is being billed as a “world first”. Geoff will be interviewed live on stage with another legend from the industry, Australian Richard Lush, who also worked extensively with the Beatles in the 1960’s. And they’ll play examples of how they came up with some of the unique and ground-breaking sounds we hear on the Beatles recordings. This entry was posted in Abbey Road Studio, Beatles, Beatles Music, Beatles Related, EMI Records and tagged Abbey Road, Beatles, Beatles Related, Geoff Emerick, George Martin, Music by beatlesblogger. Bookmark the permalink.